EL JOVEN FRANKENSTEIN Viaja a Argentina!!! Wait—we aren’t in Argentina are we? Let’s try that this time in English. It’s Alive!!! 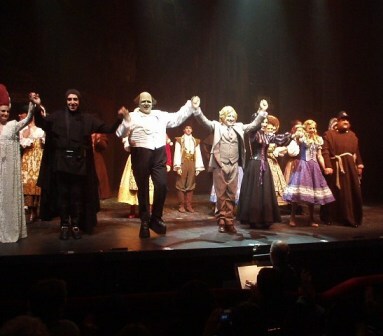 Young Frankenstein opened in Bueños Aires (Argentina) June 3rd and is the first international production of the musical to date. Young Frankenstein (Spanish title El Joven Frankenstein) stars the famous Argentinean film and television actor, Guillermo Francella, as Frederick Frankenstein. In 2005 and 2006 Guillermo Francella delighted over 265,000 audience members as Leo Bloom in the Argentinean premiere of The Producers (Spanish title Los Productores). While he is well known for his film and television credits, The Producers was Guillermo’s first musical. But after starring in The Producers, Guillermo now has the confidence to tackle another leading role in a new musical, particularly since he is an avid fanatic of the original Gene Wilder film. Along with the opportunity to act, sing (a bit) and dance in a different show, Guillermo gets to perform in a different venue. 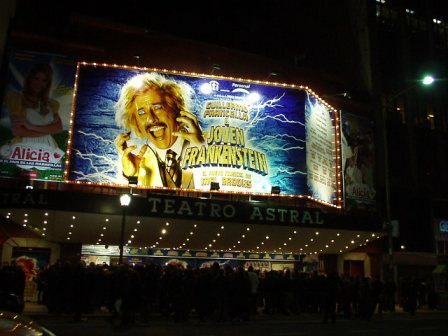 El Joven Frankenstein plays at El Teatro Astral, whereas Los Productores played at El Teatro Lola Membrives. Much of the creative team remains the same remains the same, however. Enrique Pinti, who co-stared with Francella in Los Productores as Max Bialystoc, adapted the songs for both musicals; Pablo Kompel produced both productions; Ricky Pashkus was the general director for both musicals; Fernando Masllorens and Federico González del Pino translated the books and the songs of both musicals; and Carlos Olivieri was the acting director for both productions. Additionally, El Joven Frankenstein reunites nine other designer/production crew members and five cast members from Los Productores. With an already proven team, this production promises to be another winner. Tickets for El Joven Frankenstein are now selling through June 21st with six performances each week (Mondays and Tuesdays there are no performances). Unlike typical Broadway productions, curtain times vary from performance to performance: 8:30pm on Wednesday and Thursdays, 9pm on Fridays, 7:30pm and 11pm Saturdays, and 8pm on Sundays. El Teatro Astral has a maximum capacity of 1280 seats (comparable to Broadway’s August Wilson and Nederlander Theatres) and is divided into 12 sections for ticket sales, which vary in price from 70 pesos to 200 pesos (about $19 to $54 in US currency). The original Broadway production of Young Frankenstein premiered at the Paramount Theatre in Seattle Washington before switching coasts to Broadway’s Hilton theatre. At the Hilton, it ran for a combined 500 performances (previews and performances), opening November 8th 2007 and closing January 4th 2009. In the original production, Mel Brooks wrote songs and lyrics and assisted Thomas Meehan with the book, and Susan Stroman directed and choreographed. The original production garnered 3 Tony Award nominations and eight Drama Desk Award nominations. MTI thrives internationally and hopes to “put on the ritz” in other international productions. To the cast and production crew of El Joven Frankenstein “Rompan una pierna! (Break a leg! ).